He’s a tall man who likes to fix things. She’s a small mouse who likes to find things. Could this be the beginning of a beautiful friendship? On a tall hill, in a tall house, live a tall man and a small mouse. All day the man does tall things, like untangling swings and rescuing cats from trees. All night the mouse does small things, like finding pins and pens, corks and long-lost forks. The two never see each other until the day the mouse takes a snooze in the man’s long shoes . . . SQUEAK! EEK! Can this duo get along — and maybe even become the perfect mix? 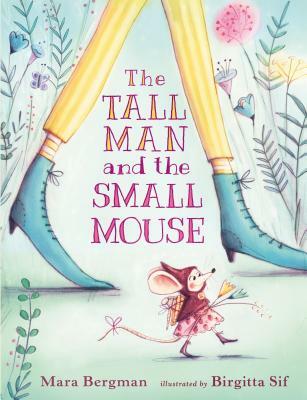 A rhythmic, rhyming narration pairs with charming illustrations to celebrate the tall and short of an unlikely friendship — and the surprising benefits of working together. Mara Bergman is an award-winning author, poet, and editor who has written more than twenty books for young children, including Bears, Bears Everywhere! ; Snip Snap! What’s That? ; Oliver Who Would Not Sleep; and Oliver Who Travelled Far and Wide. Born in New York and raised on Long Island, she now lives in England. Birgitta Sif studied art and design in the U.S. and worked as a children’s book designer before moving to England to study illustration. She is the author and illustrator of several books for children. Born in Reykjavik, Iceland, Birgitta Sif now lives with her family in England. Bergman, who writes poetry as well as picture books, creates a rhythmic, rhyming text that reads aloud beautifully...Capturing the sense, the polish, and the wit of the verse, Sif’s digitally colored pencil drawings bring their own elegance and charm to the narrative while adding amusing details for curious viewers to discover. A beguiling picture book for imaginative children. Gentle rhymes and rhythm combine with equally gentle art as the two characters become a working team and then friends. Sweet fun for storytime and bedtime.